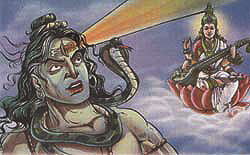 Once Shiva saw the world filled with evil. He decided to clean it and opened his third eye from which came a great fire. Saraswati took the form of a river and absorbed the fire. She took it into the sea where it formed a fire-spitting creature called Badavagni. Saraswati declared, "As long as man is wise, the animal will remain here, but if man becomes corrupt, this beast will destroy the world."